I had a fun day of stitching, chatting and shopping at Amy's yesterday. It was so nice to get away from it all for a day. 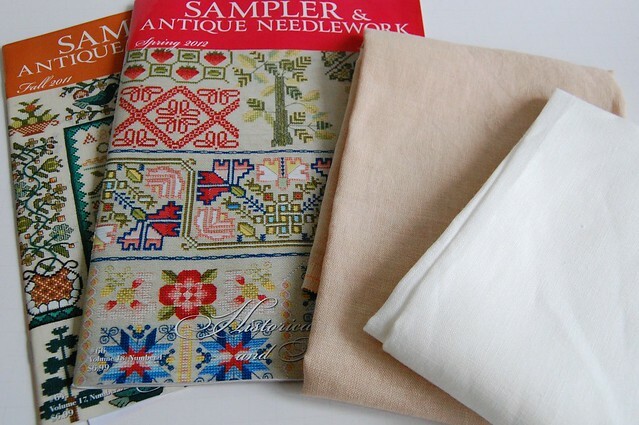 I got a couple of Sampler and Antique Needlework Quarterlies (Fall '11 and Spring '12) and two pieces of 40 ct. linen (Vintage Lt. Examplar and Antique White) from her online shop, Down Sunshine Lane. While there, I worked on "Be Kind and True" a little bit. What a beautiful piece you are working on!!! It is lovely and your stash is great!!! Sounds like a great time, Nicole! Always nice to go to your LNS and stitch and stash! Looks like you had a great day! I love your stitching. Nice stash... glad you had a good day at your LNS. Oh Be Kind and True is lovely !! Love your BBD start! Nice stash too. Love the new start, and you picked up some great stash. I'm glad you got to get away for a bit and spend some time with stitching friends. I love the piece you are working on. I don't think I have have seen that one. Wow...you must have some great contacts to have received the Spring '13 issue already. Ha...just teasing...I'm sure it's a typo. Fun stash and I love your new piece!!!! I agree with you, it IS nice to get away from it all and stitch with a friend! As always, your stitching is fabulous! Love your new stash and the stitching looks great! I can't wait to watch that one grow. Beautiful stash you got!! Lovely stitching too!! Great to see you have been back to stitching again! Stashing is a wonderful thing to do, of course :) Sarah is looking very nice. I just saw Margaret's finish and you are right behind her. Go, Nicole!! Nicole, I'm glad you had a good day stitching with friends! It is good to get away once in awhile. 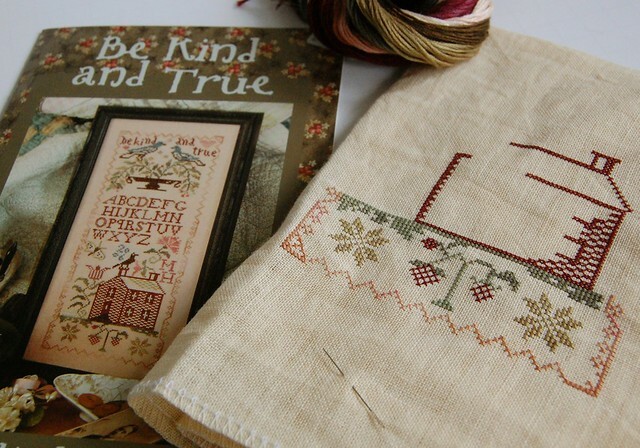 Be Kind and True is a very sweet design! And your SEB is gorgeous! New fabric stash is always nice! It is always nice to spend time with friends. Nice stash and your stitching looks great. Nice progress on your WIP! Love the new stash, too! Nothing's better than stitching except stitching AND stashing! Lovely stitching and some fine stashing! Glad you had a chance to get away. Be kind & Sarah are looking gorgeous. Ooooh, such pretty stash! Love the new start.